November is the time I usually go on vacation to the Caribbean. Prices are relatively cheap compared to the rest of the year and it’s a nice way to extend the summer as November brings dark days, cold winds, rain and snow. As I’ve mentioned one of my favourite places to go in the Caribbean is Punta Cana of the Dominican Republic. I won’t be able to make a trip this year, but hopefully next November I’ll be able to go. Now that I’ve got my Sony Cyber-shot T100 I’ll be able to take some amazing HD pictures and videos. 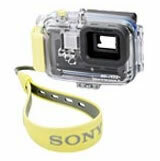 Something I would like to get before making a trip like that is the underwater case for the T100. The MPK-THD marine pack let’s you take breathtaking underwater photos of fish, reefs and other extraordinary sea life. You can dive up to 132 feet. I know there are disposable underwater cameras for a lower price, but there is no way they can match the picture quality of the T100. At $136US it might be a little pricey, but I guarantee you friends will be amazed with the pictures taken. « What Does It Feel Like To Get Shot?